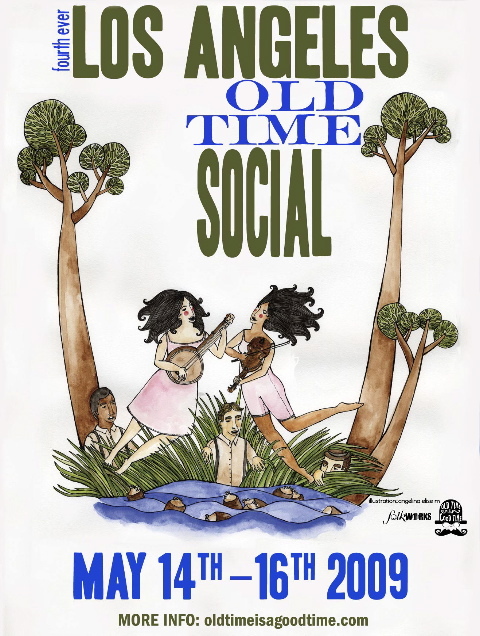 This year is the 4th Ever Los Angeles Old-Time Social. May 14, 15 , 16 will see concerts, workshops, parties, jams and a big square dance! May 17th is the Topanga Banjo and Fiddle Contest to top off the wkend! All details are here. *****************************************************************Thurs. 5/14, 9pm, Free: Kick Off! Sat. 5/16, 2-10pm, Free: Workshops & Square Dance! K. Boogie and the Brownbaggers: K.Boogie and the Brown Baggers are Ben Guzman, Mike Heinle, Kelly Martin, Joe Wack, and Steve Lewis. They may be the newest old-time band in LA, but they’re hardly lacking in experience. Ben, Mike, and Kelly comprise the always-in-demand Triple Chicken Foot band. Joe and Steve have played together in various bands for over 15 years. The lineup for K.Boogie and the Brown Baggers features Ben and Joe on fiddles, Kelly on guitar, Mike playing bass, and Steve on fretless banjo. Their dance music draws on the traditional tunes and styles of the southern Appalachians. It’s lively, energetic, and fun for all. Pierson’s Pork Pies: Pearson’s Pork Pies began as a group of neighbors who played a square dance in 2006 and just kept on getting together. They have been heaping an evenly spiced filling into a buttery, flaky crust ever since — never a soggy bottom, and that’s a promise. Band lineup for the 2009 LAOTS is Amy Hofer on fiddle, Dan Kluger on banjo, Matt Knoth on guitar, and Mike Heinle on bass. This entry was posted on Wednesday, May 6th, 2009 at 1:39 amand is filed under . You can follow any responses to this entry through the RSS 2.0 feed. Responses are currently closed, but you can trackback from your own site.